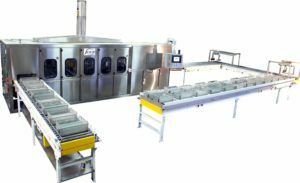 There are several types of ultrasonic cleaning systems for extremely difficult cleaning problems or critical cleanliness levels on precision assemblies; Systems include various tanks sizes, separate tank and remote generator design, and/or completely enclosed cabinet units. We also offer custom designed automated cleaning systems. Cost-effective immersible ultrasonic systems can be added to existing cleaning tanks to accelerate the current process.